You can join us and send him a letter to let him know his views are outdated and unwanted. Click here to email him directly. We are writing to protest and to express our revulsion at your latest anti-Roma outburst. As reported in the Czech media, at a public meeting in Kojetin, after you declared that it was exactly clear ‘who’ the 5% of unemployed are, you went on to reminisce about the communist era when Romani people "had to work" and would be imprisoned if they did not: "Most of them worked as ditch-diggers, and if they refused to work, they were designated as work-shy and went to prison." You then went on to say that among the Romani work crews, if one guy didn’t work “they slapped him around. It’s a very humane method that worked most of the time." This is not the first time you have made such disparaging statements about Roma. Your racist scorn for Romani citizens of the Czech Republic is a matter of public record, you have previously alleged that 90% of the ‘indaptables’ in the Czech Republic are of Romani origin. Your strident xenophobic and intolerant statements have attracted much international criticism, including that of the UN High Commissioner for Human Rights and the European Commission against Racism and Intolerance (ECRI). When you, as a president of a democratic republic repeatedly refer to your Romani fellow-citizens as ‘inadaptables’, fondly recall a time – a time of Communist dictatorship – when they could be dealt a good slapping, and call this humane, we have reached a new low. This statement amounts to blatant hate speech, crude racist incitement and has no place in the European Union. Your abusive rhetoric, designed to stoke fear and racist resentment, poses a direct threat to democratic values and the security of individuals and communities. 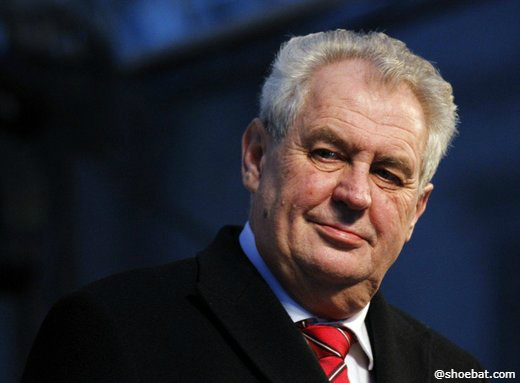 We declare our solidarity with those Czech citizens who call on you to desist and to resign from the office upon which you have heaped so much disrepute.